The "Mech Bay" is the general term for the game interface when you are not on the battlefield. This section will break down the screens and menus piece by piece. Because this interface must work on many different monitors and resolutions, the Mech Bay is very modular. The below images were taken on a 1920 x 1080 display. The landing page you see when you login to MWO and after every match you are presented with the MWO Home Screen. You can also get to this screen by selecting the "Home" button at the top of the screen. 1. Pilot Info - Your pilot name, Title and Pilot Skill Rating (PSR). The bar at the bottom fills as you get closer to the next higher rating. 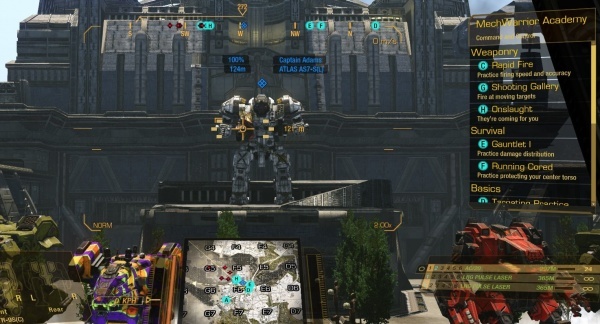 Your name and title are displayed above your 'Mech on the battlefield. See Titles/Badges for more information on titles. 2. Unit Info - Your Unit name, Unit tag and number of members. If you are not a member of a Unit, this is left blank. These three windows may be minimized to give you a better view of your 'Mech. Next to the bottom window is a camera icon. Select this to enable a first person camera, as if you were walking on the floor of the Mech Bay. 4. Wallet - Your economic information: amount of premium time, MechCredits (MC), COMSTAR bills (C-Bills, or CB) and General Experience (GXP). Here you can activate stored premium time and purchase additional MC (via your default web browser). Displays all the 'Mechs you can pilot - the ones you own and trial 'Mechs. 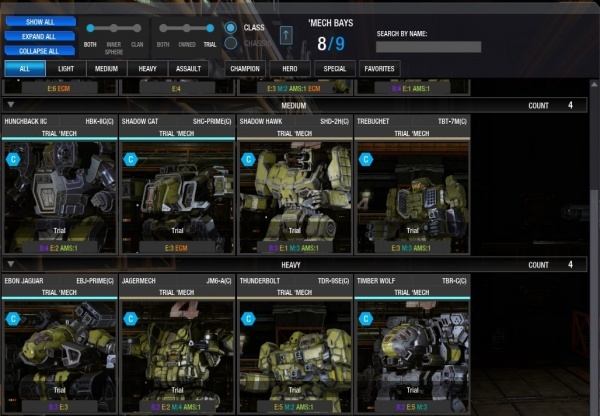 You can filter by technology base (Inner Sphere or Clan) and/or class (Light, Medium, Heavy, Assault) and sub-filter for Champion, Hero and Special variants. You can order by class or chassis, ascending or descending. You can declare any 'Mech you own as a "favorite", and filter on that setting. Displays what you own: BattleMechs, Weapons, Equipment and Clan Omnipods. You can sell them for C-Bills here at 50% their purchase price. Here is where your redeem your supply caches, see [Supply Cache] for more information. The games tracks you across matches and rewards you with Achievements for certain events. The rewards include C-Bills, GXP and titles. For example, surviving a match with less than 20% health completes the "Yep, Dead for Sure" achievement and you are rewarded with the title "Bad Company". See Titles/Badges for more information. 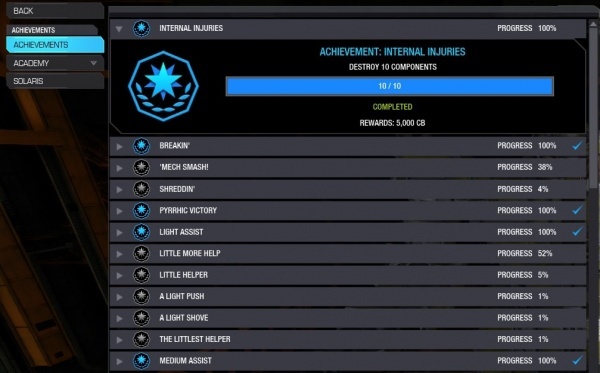 There are unique achievements within the MechWarrior Academy and Solaris game mode. 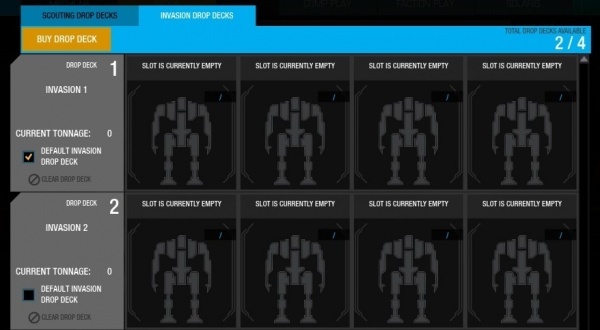 Manage your Faction Play scouting and invasion drop decks. See Faction Play for more information. Convert your XP in a specific 'Mech to GXP, for use with any 'Mech by spending MC. Opens your default web browser to display your game statistics. See all player's game statistics for the current season (month). Sort by Average Match Score, Total Kills, Total Deaths, Kill/Death Ration, Total Wins, Total Losses, Win/Loss Ration and Games Players. You can look by 'Mech class or global. Opens you default web browser so you can enter a coupon code to redeem MWO content. 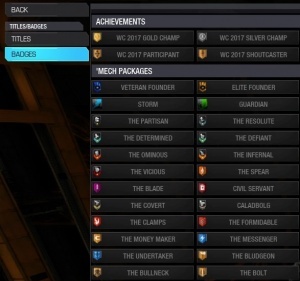 Select what title and badge you want shown. 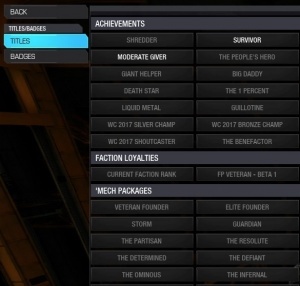 Titles are displayed above your 'Mech on the battlefield and badges are displayed in lobby. 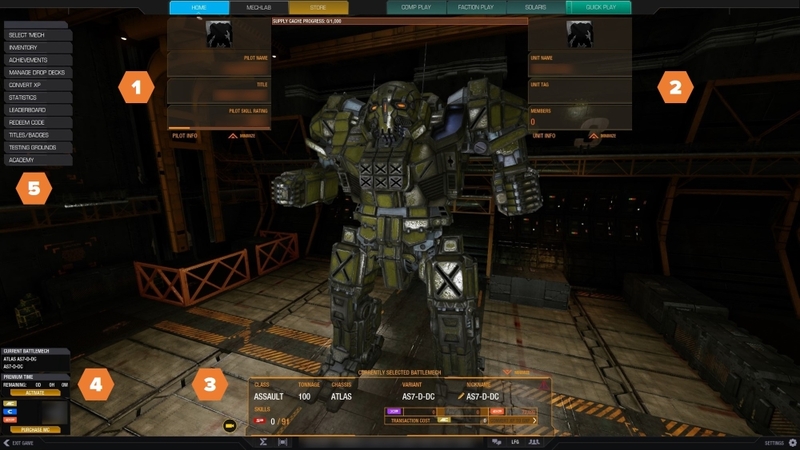 Titles and Badges are granted to you via in-game Achievements or by purchasing MWO content. Titles and badges that you are not eligible for are grayed out. 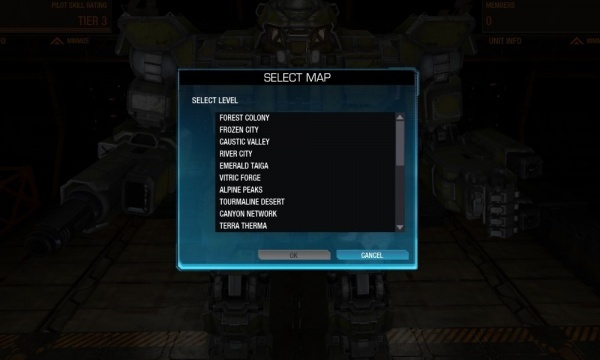 Select a Quick Play or Faction Play map to test your current 'Mech on. 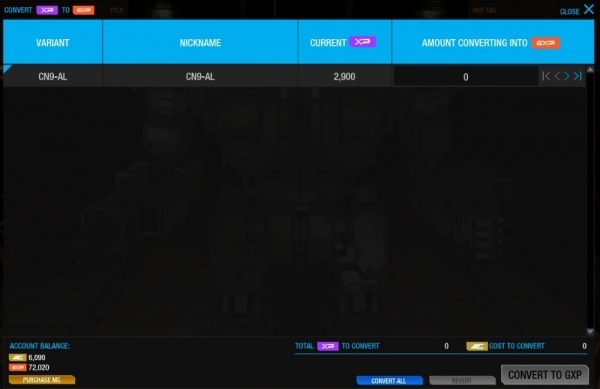 You can change your 'Mech load out and test it on different environments before saving and purchasing components. There are eight stationary target 'Mechs to practice against. 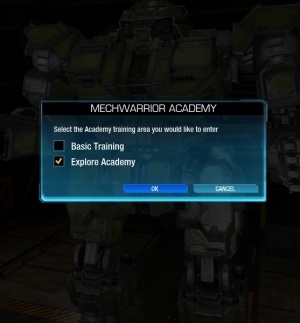 Select "Basic Training" to play the scripted tutorial, or select "Explore Academy" to roam though the different training scenarios. See MechWarrior Academy for more information. Shoot Captain Adams in the face - but don't do it twice!